NGC 6781 is a nice example of a planetary nebula. These nebulae are formed when a star begins reaching its end of life. The star begins throwing off shells of gas that expand away from the star. This forms a ring of hot ionized gas that we see as a planetary nebula. In this photo, the bright bluish star at the center of the nebula is the star that created the planetary nebula. 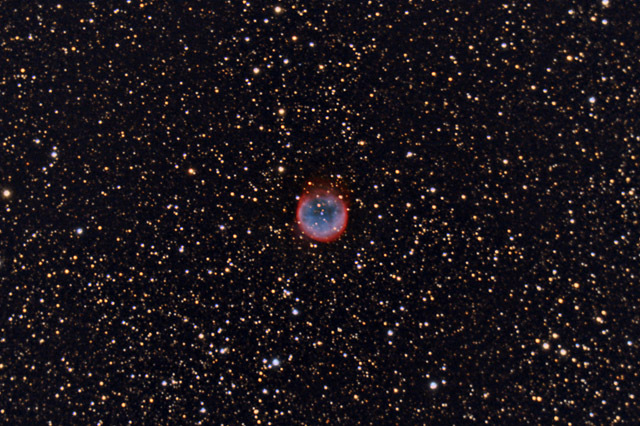 The nebula is about 2 arc minutes in apparent diameter - a little bit larger than its more famous cousin, the Ring Nebula. In this image, North is Up. This image is cropped to 39% of the original full frame. Software Used Images Plus 4.0 for camera control, calibration, stacking and digital development. Photoshop CS5 used for flat fielding, curves, color correction, saturation adjustments, star shrinking, and high pass filter. HLVG for additional color correction, Carboni Actions for additional saturation adjustments. Notes This is a nice planetary which is not too commonly photographed. I'm fairly pleased with the final result.